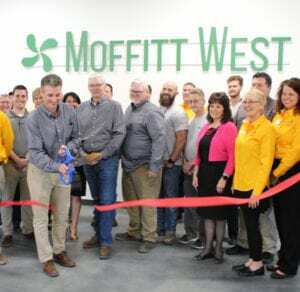 DENISON, TX – Moffitt West (“Moffitt”), a leading manufacturer of natural ventilation solutions, celebrated its factory expansion at a ribbon cutting in Denison, Texas on March 21st. Moffitt President John Moffitt cut the ribbon, and officially reopened the new and improved factory. John Moffitt was joined at the ribbon cutting by Plant Manager Clark Crandall, Director of Engineering and Operations Mike Berry, Manufacturing Engineer Curtis Sorenson, and the entire Moffitt West crew. They welcomed guests including Denison Mayor Janet Gott, Ambassadors from the Chamber of Commerce, local vendors, and community members. The new expansion increases the total footprint of the facility nearly 70%. It adds room for additional staff, increased production, and improved warehousing and shipping. The main part of this addition is the 10,000+ ft2 expansion of the workshop floor. An additional 3,500 ft2 of office space was also added to the front of the building. This new space creates a more useful area for management as well as the product engineering staff. It includes several offices, a new conference room, and an expanded and upgraded break room. Click here to read about the beginning of the expansion project. This expansion also provided Moffitt West the perfect opportunity to improve its own ventilation system as well. Two (2) CoolStream adiabatic cooling units and two (2) Apollo natural ventilators were installed over the factory floor, while a Firelight natural casement ventilator and eight (8) Coltlite CLT ventilators were installed in the new break room. 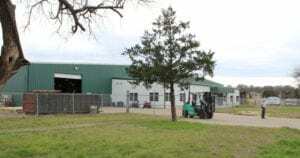 These units will provide natural cooling and natural ventilation all year round, and prove especially useful during the hot Texas summers where they should lower temperatures up to 25˚. Moffitt West has been a part of Moffitt Corporation since 2016. Before then, it had been in operation as Western Canwell since 1984. Moffitt West manufactures a variety of industrial ventilation products including the MoffittVent™, Moffitt Labyrinth, Ridgepac, and Thermoflow® ventilators. They are probably best known for the Moffitt Firex™ smoke exhaust vent. Moffitt West is located in Denison, TX.